Hey, isn’t a scarecrow supposed to be scary? 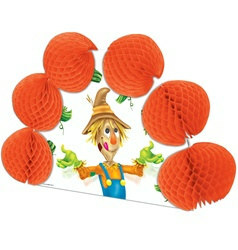 Scarecrow Pop-Over Centerpiece features a cute and lovable scarecrow that will entertain your dinner guest with the art of juggling pumpkins. Decorate your dinner table this Fall season with Scarecrow Pop-Over Centerpiece. We offer a variety of pop-over centerpieces for any and all occasions and holidays.